﻿﻿ New Street Fighter 5 DLC Character Falke Releases In April on Readyforgame.com - Free Online Games! Capcom has confirmed that Falke, the next DLC fighter for Street Fighter V, will be available from April 24. Falke will be available for $6 or 100,000 Fight Money. International pricing hasn't been confirmed but is likely to be in line with previous characters. Falke also included in the Season 3 character pass, which also grants access to Sakura and Blanka (both available now), as well as Cody, G, and Sagat (coming in the future). She's a brand new character to the series but, like Ed and M. Bison, utilizes Psycho Power in her fighting style. "Falke was built to be an alternative clone for M. Bison," explains Capcom. "She was heavily experimented on by Shadaloo and was forced to train day in, day out to achieve perfection. 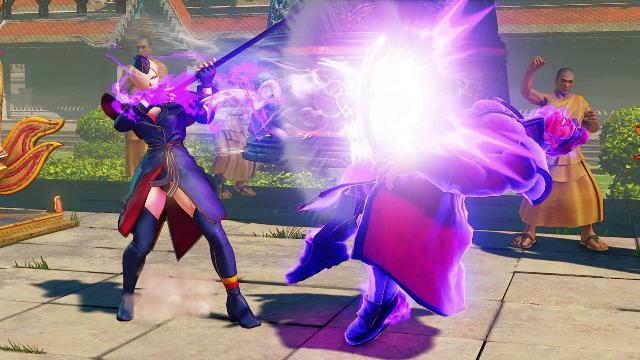 "Falke has the unique ability to infuse Psycho Power into objects and release it through them, mainly through her staff, which she named Harmony," the official description continues. "Years of harsh training went by, causing Falke to spiral deep into despair, wishing for it all to end. Finally, Ed came to her rescue and they both were able to escape Shadaloo. Now, the two have a sibling-like bond and are searching for others like them in need of help." Falke's fighting style leans heavily on a staff that uses to keep enemies at a distance. Her attackes are also infused with Psycho Power, which players can channel by holding down any punch button. Since her staff effectively acts as a conduit, these moves can be charged up and released in a number of ways. While standing a blast of Psycho Power can be shot out like a shotgun, in the air a projectile can be shot downwards diagonally, and while crouching Falke goes prone and shoots a projectile at an enemy's feet. This prone move, called Psycho Kanonen, can also be used to duck incoming projectiles, giving it both offensive and defensive applications. "Like Ed, some of Falke's special moves only require either two punch or two kick buttons--no special inputs required," Capcom says. "Pressing two punches will result in Psycho Schneide, which is her version of an uppercut. Pressing two kicks is Katapult, which sees Falke pole vaulting towards the opponent in a kick motion." Falke's V-Skill is called Psycho Trombe and during it she spins her staff in front of her. This move can then be cancelled by a "variety of normal moves and can also be used to absorb projectiles." Her V-Trigger, meanwhile, is called Staerken and "powers up her ability to infuse and release Psycho Power from her staff and will allow her to use additional versions of her special moves without needing to charge up in advance." Her V-Trigger II, known as Psycho Angriff, lets her "twirl around hitting the opponent into the air, which she then follows up with a surge of Psycho Power." If you press hard punch and hard kick during this, Psycho Sturm will be activated to deliver a sweeping staff attack that can be cancelled for combo extensions. Down, hard punch, and hard kick, meanwhile, will make Falke jump into the air diagonally and slam her staff down onto her enemy. Finally, Falke's Critical Art is called Psycho Fluegel and, on hit, will launch enemies into the air, make her pole vault up to them and then knock them about with her staff. As expected from a Critical Art, it's over the top and flashy.